This article is about the parent company to The Ritz-Carlton Hotel brand. For other uses, see Ritz (disambiguation) and Carlton Hotel (disambiguation). The Ritz-Carlton Hotel Company, LLC is an American company that operates the luxury hotel chain known as The Ritz-Carlton. The company has 91 luxury hotels and resorts in 30 countries and territories. The current company was founded in 1983, when the previous owners sold the Ritz-Carlton brand name and the Ritz-Carlton hotel in Boston, Massachusetts. The brand was subsequently expanded to other locations. The company is today a subsidiary of Marriott International. The story of The Ritz-Carlton begins with Swiss hotelier César Ritz, who was well known in the hotel industry as the "king of hoteliers and hotelier to kings" redefined luxury accommodation in Europe with his management of The Ritz in Paris and the Carlton Hotel in London, among others. He and the renowned chef from his hotels, Auguste Escoffier, opened a la carte restaurants known as Ritz-Carlton on board the Hamburg-Amerika Line ocean liners SS Amerika in 1905 and SS Imperator in 1913. The restaurants on those ships ceased operating in 1914 with the outbreak of World War I. Although Ritz died in 1918, his wife Marie continued the tradition of opening hotels in his name. The Ritz-Carlton Investing Company was established by Albert Keller, who bought and franchised the name in the United States. The first Ritz-Carlton Hotel in the U.S. opened in New York City in 1911. It was located at 46th Street and Madison Avenue. Louis Diat ran the kitchens and invented Vichyssoise there. In 1911, the Ritz company announced its intention to expand to Philadelphia and Atlantic City. The Ritz-Carlton Philadelphia followed in 1913 at Broad & Walnut streets, designed by Horace Trumbauer and Warren & Wetmore. The Ritz-Carlton Montreal opened in 1912, not owned by Keller as it was located in Canada. Keller's Ritz-Carlton Atlantic City opened in 1921. In October 1926, 29-year-old Edward N. Wyner bought a third-acre parcel at the corner of Arlington and Newbury streets and formed a partnership called The Ritz-Arlington Trust with his father, George, and business associate, John S. Slater. The trust sold $5.8 million of bonds to finance the construction of an apartment building to be called the Mayflower. The 18-story, 201-foot (61 m) brick building, designed by Strickland, Blodget & Law Architects, was far taller than anything else along Newbury Street at the time. Construction had started on the second floor when Wyner was persuaded by then-Mayor James Michael Curley to make the Mayflower a world-class, 300-room Ritz-Carlton Hotel, which opened May 19, 1927. Room rates were $5 to $15 per night; $40 per night for suites. After a hugely successful opening, the stock market crash of 1929 and ensuing Depression brought financial difficulties. The Wyner family funded the hotel’s operating losses during the early 1930s, although the interest on the bonds went unpaid. Still in 1933, when only 30 guests were registered in the hotel, Wyner turned on the lights in every guest room to give the appearance that the hotel was full. The Philadelphia location was converted to an office building after only a few years in operation. The Atlantic City hotel was sold to Schine Hotels in the late 1940s, and later Sheraton Hotels in 1959. The New York hotel was demolished in 1951, leaving only the Boston location. Edward Wyner died of a heart attack on December 5, 1961. His six sons tried to continue operation of the Boston hotel, but were unable to overcome difficulties, and decided to sell. The unpaid interest on the bonds dissuaded many from trying to buy the hotel. But Cabot, Cabot & Forbes principal Gerald F. Blakeley Jr. was interested. After more than a year of legal work, Hale and Dorr succeeded at clearing the bond obligations, and in October 1964 Blakeley and associates Paul Hellmuth and Charles Spaulding acquired the Ritz-Carlton Boston for $5.8 million. “Out of the 20 years I owned it, it made money three years. The other years it broke even, but from a public relations standpoint for CC&F, it was a tremendous asset,” said Blakeley, who completed a 19-story Ritz-Carlton luxury condominium complex on land adjacent to the hotel in 1981. In the late 1960s Blakeley obtained the rights to the Ritz-Carlton name in North America (with the exception of Montreal and New York). In June 1978, Blakeley was awarded the rights and privileges of the Ritz-Carlton trademark in the United States and was given a US Service Mark Registration. In the 1970s, the Ritz-Carlton name was licensed to the builders of a new hotel in Chicago. The Ritz-Carlton Chicago opened in 1975 in a tower atop Water Tower Place. It joined the Four Seasons Hotels & Resorts chain in 1977, as there was no Ritz-Carlton chain at the time. Confusingly, it remained part of Four Seasons for decades, marketed as "The Ritz-Carlton Chicago (A Four Seasons Hotel)". It had no association with the modern Ritz-Carlton chain, though it used the name and the iconic logo. The property was sold in 2013 and left Four Seasons, joining the modern Ritz-Carlton chain as a franchise on August 1, 2015. In 1982, Blakely licensed the name to hotelier John B. Coleman for two hotels he was renovating, The Fairfax in Washington, D.C. and the Navarro in New York City. Coleman renamed them The Ritz-Carlton Washington D.C. and The Ritz-Carlton New York in April 1982. Coleman paid Blakely a fee of 1.5 percent of each hotel's annual gross revenue for use of the name. The two hotels eventually joined the modern chain that would be founded a few years later. In August 1983, Blakeley sold The Ritz-Carlton Boston and the US trademark for $75.5 million to William B. Johnson, a major Waffle House franchisee who was once the largest owner. He assembled a four-person development team in Atlanta, headed by hotelier Horst Schulze, to create the Ritz-Carlton hotel brand and established The Ritz-Carlton Hotel Company in its current form. In 1988, Johnson subsequently obtained the exclusive rights to The Ritz-Carlton brand name throughout the world except for the Hôtel Ritz Paris, The Ritz-Carlton, Chicago, and the Ritz-Carlton Montreal. Unlike The Ritz-Carlton, Chicago and the Ritz-Carlton Montreal, Hôtel Ritz Paris are not associated with The Ritz-Carlton Hotel Company, joining The Leading Hotels of the World. The Ritz-Carlton at the Autostadt in Wolfsburg, Germany: completed in 2000, it was the first hotel of the company to open in Europe. From 1951 to 1975, The Ritz-Carlton Boston had been one of only two Ritz-Carlton hotels in the US. The other was the independently owned Ritz-Carlton Atlantic City which had since been converted to condominiums. Johnson's company paid the Atlantic City establishment to abandon its name and rename itself The Ritz Condominiums. Johnson would later enlarge the company from just the Boston property to 30 hotels worldwide in just 10 years. He obtained financing to do so from Manufacturers Hanover Trust of New York in 1983 in the amount of $85 million secured by The Ritz-Carlton Boston. This loan was refinanced in 1989 by Manhattan Tops USA of New York for $136.5 million and again in 1994 by The Sumitomo Bank of Japan. By 1996, this mortgage was in default and the interest and penalties brought the total debt to $214.8 million. By splitting this mortgage note into three parts, Sumitomo Bank was able to unbundle The Ritz-Carlton Boston from the trademark rights to the Ritz-Carlton brand worldwide. Blackstone Real Estate Acquisitions bought The Ritz-Carlton Boston at auction for $75 million in February 1998. A month later, Marriott International acquired the hotel from Blackstone for $100 million. Marriott International, which franchised and managed over 325,000 rooms, then bought The Ritz-Carlton Hotel Co. and rights to the Ritz-Carlton hotel chain worldwide from Johnson for $290 million in a two-part transaction completed in 1998. In 1998, Christopher Jeffries, founding partner of Millennium Partners, obtained The Ritz-Carlton franchises from Marriott for four hotel properties under construction: two in Washington, one in New York City, and one in Atlanta, Georgia. In addition, Jeffries was searching for a brand affiliation for the new 155-room hotel and 270-luxury condominiums he was constructing as part of Boston’s 1,800,000-square-foot (170,000 m2) Millennium Place, a mixed-use complex on lower Washington Street. Due to noncompetition clauses, the only way he could obtain a second Ritz-Carlton flag in Boston was to own the existing Ritz-Carlton. Millennium Partners acquired the original Ritz-Carlton Boston for $122 million (though it had sold for just $75 million less than two years prior) and spent $50 million for renovations. Marriott agreed to allow The Ritz-Carlton affiliation for the condominium complex, known as The Residences at The Ritz-Carlton, sharing all of the services of the hotel. From 2001 to 2007, Boston was home to two Ritz-Carlton hotels that faced each other across Boston Common. The Ritz-Carlton, Boston Common opened in 2001. In November 2006, Taj Hotels, a subsidiary of the India-based Tata Group, purchased The Ritz-Carlton Boston from its owners, Millennium Partners for $170 million. The Ritz-Carlton Boston became the Taj Boston on January 11, 2007. The company grew under the leadership of President and COO Horst Schulze. Schulze instituted a company-wide concentration on both the personal and the data-driven sides of service: He coined the company's well-known customer/employee-centered motto, "We are Ladies and Gentlemen Serving Ladies and Gentlemen" and the set of specific service values (standards) on which The Ritz-Carlton employees base service through the present day. Under his leadership the hotels earned an unprecedented two Malcolm Baldrige National Quality Awards and grew from four to forty U.S. locations. During this time, The Ritz-Carlton also became known for its influence on service in a wide range of industries, through the creation of The Ritz-Carlton Learning Institute and The Ritz-Carlton Leadership Center, created by then-Ritz executive Leonardo Inghilleri, who was an architect of the Ritz's second Baldrige award, where executives from other companies worldwide in many disciplines come to learn The Ritz-Carlton principles of service. In 1995, Marriott International purchased a 49% stake in The Ritz-Carlton Hotel Company, and in 1998, they purchased an additional 50% stake in the company, giving it 99% ownership of the company. Schulze and other executives (including Leonardo Inghilleri, Robert A. Warman and Peter Schoch) left to form the West Paces Hotel Group, which took the name of its primary brand, Capella Hotels, in December 2011. In 2007, the partners also formed Solís Hotels. The Ritz-Carlton Hotel Company is now headquartered in Chevy Chase, Maryland, located in the Washington, D.C. MSA. The Ritz-Carlton Hotel Company partnered with Bulgari in 2001 to operate a chain of hotels owned by and operated under the BVLGARI brand. The company currently has marketing agreements with Bulgari Hotels & Resorts, the Cosmopolitan of Las Vegas, the privately owned Ritz-Carlton Montreal, The Ritz Hotel London and the Hotel Ritz, Madrid. In 2011, The Ritz-Carlton, Hong Kong was opened. It is currently the highest hotel in the world. Simon Cooper joined Ritz-Carlton in 2001 as President and Chief Operating Officer, taking the helm from Horst Schulze. Cooper's mandate was to grow the chain through hotel expansion and product diversification. Under Cooper's watch the company has aggressively expanded its hotels and added The Ritz-Carlton Residences, private residential units, and The Ritz-Carlton Destination Club, fractional ownership residences, to the company's development program. August 12, 2010, Ritz-Carlton announced its new President and Chief Operations Officer would be Herve Humler, one of the founders of the 1983 company, who will be responsible for leading brand operations and global growth strategy. In 2015, The Ritz-Carlton, Macau was opened. It is located at the Galaxy Macau. The Ritz-Carlton, Macau is designed as a gold palace. The Ritz-Carlton Hotel Company has been featured on Zagat Survey Top Lists for dining, hotels and service. The Dallas, USA and Wolfsburg, Germany locations both received top honors from Zagat in 2009, including Top Large Hotel for the Dallas location. The Ritz-Carlton is the only company to date to win two Malcolm Baldrige National Quality Awards (1992 and 1999). Ritz-Carlton's President and COO Horst Schulze was recognized for Ritz-Carlton's contributions during his tenure with Corporate Hotelier of the World Ishikawa Medal for contributions to the Quality movement. The Ritz-Carlton is notable for attempting to share its knowledge of quality as it applies to service. Initially this was done at the request of the Baldrige committee, but The Ritz-Carlton ultimately adopted this as a central mission through the creation of The Ritz-Carlton Learning Institute and The Ritz-Carlton Leadership Center. In October, 2011, Angella Reid, the General Manager of The Ritz-Carlton Hotel in Pentagon City, Virginia was appointed as White House Chief Usher, becoming the first woman to serve in that post. It also has major service training operations in its Ritz-Carlton Learning Institute and Ritz-Carlton Leadership Center, created by Ritz-Carlton executive (emeritus) Leonardo Inghilleri, where nearly 50,000 executives from other companies worldwide have been trained in The Ritz-Carlton principles of service. In 1999 Ritz-Carlton acquired the former Hotel St. Moritz in New York City, reestablishing a presence for the brand in New York City for the first time since the former Ritz-Carlton New York left the Ritz-Carlton stable in 1997 (it later became a Westin, then an InterContinental). The first Ritz-Carlton Hotel in Russia, The Moscow Ritz-Carlton [ru], opened 1 July 2007 on Tverskaya Street. The Ritz-Carlton Suite, billed at US$13,715 per night, is listed at number 13 on World's 15 most expensive hotel suites compiled by CNN in 2012. In 2014, Oberoi Realty and Ritz-Carlton announced they would construct a hotel in Mumbai with an expected opening in 2016. Ritz-Carlton opened its first Indian property in Bangalore in 2013. 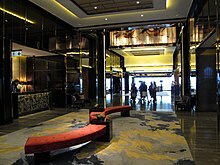 On 29 March 2011, The Ritz-Carlton opened the highest hotel in the world, The Ritz-Carlton, Hong Kong on floors 102-118 of the International Commerce Centre in Tsim Sha Tsui on Kowloon Peninsula, Hong Kong. The lobby is 425 m (1,394 ft) above the ground. Asian Headquarters of Morgan Stanley, Credit Suisse, and Deutsche Bank are also located in the same 118-storey building. The Ritz-Carlton, Charlotte which opened in October 2009 is the first Ritz-Carlton property to earn LEED Gold Certification and the youngest Ritz-Carlton property to earn five-diamonds, and is the only five diamond property in Charlotte (and one of only three in the state of North Carolina). The Ritz-Carlton, Fort Lauderdale (AAA Five Diamond Award) which opened in August 2008 opened as a St. Regis just one year prior. The Ritz-Carlton and JW Marriott Hotels at L.A. Live opened February 2010 and share the first skyscraper built since the early 1990s in Downtown Los Angeles. The Ritz-Carlton, Los Angeles was awarded a LEED silver certification. The readers of Condé Nast Traveler elected The Ritz-Carlton Shanghai, Pudong as "The Best Hotel in Asia" from 2012 through 2014. The Ritz-Carlton operates fractional residences at several locations in the United States under the name Ritz-Carlton Destination Club. Properties include Aspen Highlands and Vail in Colorado, St. Thomas in the U.S. Virgin Islands, San Francisco and Jupiter, Florida. On Tuesday, 17 July 2009, at 7:47 a.m. Jakarta time, a bomb exploded in The Ritz-Carlton Mega Kuningan, Jakarta, Indonesia destroying the first floor of the hotel. The explosion occurred 2 minutes after the explosion at the nearby JW Marriott Jakarta. The hotel was scheduled to host the Manchester United football club the following Monday during the Indonesia leg of its Asia tour, but the visit was canceled due to the bombing. Nine people including 2 suicide bombers were killed. On 26 August 2013, members of the Filipino diaspora protested at The Ritz-Carlton, Los Angeles and JW Marriott Hotels at L.A. Live against the Priority Development Assistance Fund scam. It is believed that the family of the alleged mastermind of the scam Janet Lim-Napoles owned a condominium unit in the building said to be worth $2 million. On 31 October 2013, The Ritz-Carlton Bangalore opened as the group's first property in India. On 4 November 2013, the Ritz-Carlton Kazakhstan opened in Almaty. The 145-room hotel sits on the top floors of the Esentai Tower, the tallest building in Central Asia. The upper floors also include the Ritz-Carlton Residences as well. The hotel includes a steakhouse, a sky bar, a business center, spa and 9,000 square metres (97,000 sq ft) of meeting space. The rooms include in-room safes, power outlets for laptops, iPod docking stations and marble bathrooms. In January 2014, Ritz-Carlton opened a hotel in Herzliya, Israel featuring a spa and the brand's first kosher restaurant. The Ritz-Carlton Kuala Lumpur in Malaysia's capital city, opened in 1997, is the only 'all butler hotel' operating in the city, offering butler service to all of its 300+ rooms and suites and has since been ranked among the "Gold List" of hotels by Condé Nast, ranked as "one of the top five butler hotels" by The Independent and regarded by Travel and Leisure as one of "The World's Greatest Hotels". In 2018, Ritz-Carlton announced that it would enter the cruise market. In 2019, the first Ritz-Carlton was launched from a Spanish shipyard. The cruising arm of Ritz-Carlton will begin operations in 2020 under the brand "Ritz-Carlton Yacht Collection". Jimbaran, Bali, Indonesia: Management terminated in 2009. Property currently named Ayana Hotel Jimbaran. In E.B. White's children's novel The Trumpet of the Swan, the main character Louis (a trumpeter swan) stays at the Ritz-Carlton Boston, where he eats watercress sandwiches and sleeps in the bathtub. On the HBO original series Boardwalk Empire, the character of Enoch "Nucky" Thompson (portrayed by Steve Buscemi), the treasurer of Atlantic County, occupies the entire 9th floor of a fictionalized version of the hotel in Atlantic City, New Jersey. The real Enoch "Nucky" Johnson on which Nucky Thompson was based did in fact occupy an entire floor of suites at the Ritz-Carlton Atlantic City until his arrest in 1941 on charges of tax evasion. A 1922 short story by F. Scott Fitzgerald is titled, "The Diamond as Big as the Ritz." The 2003 movie, American Wedding used the Ritz-Carlton in Half Moon Bay, California, as the filming location for the wedding venue. In 2015, the rapper Plies released the song "Ritz Carlton". In the song, he raps about his affinity for routinely spending time at the lavish hotel. He also boasts about a prior situation where he "ran off on the plug twice". The Ritz Paris was also referenced in Kenneth Oppel's novel Skybreaker. The main character visits for a meeting with a man who wants the coordinates of the mythical airship Hyperion. The man he meets mentions that he enjoyed "putting on the Ritz", but would be foolish to pay for it. American telenovela and drama Jane the Virgin, aired on The CW, uses the Ritz-Carlton Marina Del Rey's property as the setting for the show, while the storyline is based in Miami (whereas that Ritz-Carlton Marina Del Rey is in Los Angeles, California). ^ a b c d e "The Ritz-Carlton Fact Sheet". The Ritz-Carlton Hotel Company. 2017. Retrieved 2 August 2017. ^ Wellman, Jos. "The Emperor of Chefs and the Chef of Emperors". Escoffier.com. Retrieved 2015-10-05. ^ "Company History". Ritz-Carlton. Retrieved 3 December 2014. ^ "Ritz-Carlton: the beginning". The Most Famous Hotels in the World. 4 November 2014. Archived from the original on 1 April 2013. Retrieved 15 July 2015. ^ Kamp, David (12 September 2006). The United States of Arugula. New York: Clarkson Potter. ISBN 978-0767915793. ^ "Hotel Chain here for Ritz-Carlton Co" (PDF). The New York Times. May 20, 1911. Retrieved 2015-07-15. ^ "Daniel J. Terra Building". Emporis. Retrieved 2015-07-15. ^ "Ritz-Carlton Hotel". Philadelphia Architects and Buildings. Retrieved 2015-07-15. ^ "The Ritz-Carlton Hotel". Architectural Record. XXXIV: 213–224. September 1913. Retrieved 2015-07-15. ^ a b c "The Ritz-Carlton Hotel - Atlantic City" (PDF). Historical Timeline. Retrieved 2015-07-15. ^ "Ritz-Carlton Hotel". New York Architecture. Retrieved 2015-07-15. ^ McGinnis, Chris (5 May 2015). "Ritz-Carlton Chicago becomes a ... Ritz-Carlton". San Francisco Chronicle. Retrieved 2015-07-15. ^ Conroy, Sarah Booth (October 26, 1998). "Accommodating a Hotel's Good Name". The Washington Post. Retrieved 2015-10-05. ^ Jack Hayes (January 1997). "Horst Schulze: puttin' on the Ritz". Nation's Restaurant News. ^ "Taj buys Ritz-Carlton in Boston for $170 m". The Economic Times. 11 November 2006. Retrieved 2015-07-15. ^ "Meet Horst Schulze". American Way. 15 July 2006. Archived from the original on October 18, 2010. Retrieved 2011-05-05. ^ "Two Manufacturers, Two Service Companies Win 1999 Baldrige Awards" (Press release). National Institute of Standards and Technology. 23 November 1999. Retrieved 2015-07-15. ^ a b Michelli, Joseph A. (4 July 2008). The New Gold Standard. McGraw Hill. p. 6. Retrieved 2015-07-15. ^ a b c "The Learning Institute". Master Connection Associates. Archived from the original on 2015-07-16. Retrieved 2015-07-15. ^ "The West Paces Hotel Group Changes Name to Capella Hotel Group to Capitalize on its Successful Luxury Brand Partners with Private Equity Firm Stonleigh Capital for Rapid Global Expansion" (PDF) (Press release). Capella Hotel Group. 14 December 2011. Retrieved 2015-07-15. ^ "Solis Lough Eske Castle Hotel opened this weekend" (PDF) (Press release). Solis Hotels. 20 December 2007. Retrieved 2015-07-15. ^ Solomon, Micah (21 April 2015). "Ritz-Carlton President Herve Humler's Leadership, Culture And Customer Service Secrets". Forbes. Retrieved 2015-07-15. ^ Jenna (12 November 2008). "Zagat Releases 2009 U.S. Hotels Survey". HotelChatter.com. Retrieved 2015-07-15. ^ "Service Excellence presented by Horst Schulze". Meeting Professionals International. 19 February 2008. Archived from the original on 26 July 2011. Retrieved 2011-05-05. ^ "White House Announces New Chief Usher, Angella Reid" (Press release). Office of the First Lady. 4 October 2011. Retrieved 2015-07-15. ^ Bagli, Charles V. (8 November 1999). "Buyer Plans for St. Moritz To Be Ritz-Carlton Flagship". The New York Times. Retrieved 2015-07-15. ^ Commercial Property/Hotels; Will the Former Ritz-Carlton Thrive as a Westin? ^ Arnold, Helen (25 March 2012). "World's 15 most expensive hotel suites". CNN. Archived from the original on 2 November 2012. Retrieved 2015-07-15. ^ "Oberoi Realty ties up with Ritz-Carlton for upcoming Worli hotel". The Economic Times. 8 May 2014. Retrieved 2015-07-15. ^ "International Commerce Centre Hong Kong". e-architect.com. 8 April 2011. Retrieved 2015-07-15. ^ "Amenities-Hotels". Sun Hung Kai Properties Ltd. 2011. Archived from the original on February 2, 2011. Retrieved 2011-05-05. ^ Alberts, Hana R. (19 May 2010). "The World's Highest Hotel". Forbes. Retrieved 2015-07-15. ^ "The Ritz-Carlton, Charlotte Celebrates LEED Gold Certification". GreenLodgingNews.com. 24 April 2010. Retrieved 2011-05-05. ^ "New JW Marriott Hotel Los Angeles at L.A. LIVE Opens" (Press release). Marriott International. 16 February 2010. ^ "Readers of Conde Nast Traveler, U.S. Name the Ritz-Carlton Shanghai, Pudong Top Hotel in Asia" (Press release). Yahoo! Finance. 8 December 2014. Retrieved 2015-07-15. ^ "Governor asks MU to reconsider cancellation". The Jakarta Post. 17 July 2009. Archived from the original on 20 July 2009. Retrieved 2009-07-20. ^ "Fugitive linked to Jakarta blasts". BBC News. 18 July 2009. Retrieved 2009-07-20. ^ "Anti-pork barrel protest spreads to provinces, some cities abroad". GMA News TV. 26 August 2013. Retrieved 25 October 2013. ^ "The Ritz-Carlton enters India with its first property in Bangalore". India Hospitality Review. 31 October 2013. Archived from the original on 16 July 2015. Retrieved 2015-07-15. ^ "The Ritz-Carlton Follows The Footsteps Of Marco Polo And Opens In Almaty, On The Old Silk Road" (Press release). MarketWatch. 4 November 2013. Retrieved 2015-07-15. ^ Elliott, Mark (5 November 2013). "Ritz-Carlton debuts in Kazakhstan". TravelDaily. Retrieved 2015-07-15. ^ Elis, Niv (16 December 2013). "Ritz-Carlton opens its doors in Israel, eyes more branches". The Jerusalem Post. Retrieved 2015-07-15. ^ "The Ritz-Carlton Kuala Lumpur now refreshed". 1 April 2016. Retrieved 2017-12-18. ^ a b JasonD (26 June 2013). "Ritz-Carlton Returns To Bali, But Loses Palm Beach and Ireland". Hotel Chatter. Retrieved 2015-07-15. ^ McConnell, Daniel; Quinlan, Ronald (2 June 2013). "Ritz sold for €1m and debts wiped". Irish Independent. Retrieved 2015-07-15. ^ "After today, the Ritz-Carlton, Buckhead is no more | Atlanta Buzz with Jennifer Brett". Retrieved 2017-12-01. ^ Chanize (18 July 2013). "The Ritz-Carlton, Montego Bay Closes and Other Caribbean News". Hotel Chatter. Retrieved 2015-07-15. ^ "Hyatt to Open All-Inclusive Resort at Former Ritz-Carlton in Montego Bay". Caribbean Journal. 26 August 2013. Retrieved 2015-07-15. ^ a b c Lii, Jane H. (1997-08-03). "4 Hotels Lose Use of Ritz-Carlton Name". The New York Times. ISSN 0362-4331. Retrieved 2017-09-25. ^ King, R.J. (20 October 2012). "The Henry in Dearborn is riding a major renovation and an economic upswing". D Business. Retrieved 2015-07-15. ^ Dostal, Erin (2 May 2010). "Lake Las Vegas, 350 workers say goodbye to Ritz-Carlton". Las Vegas Sun. Retrieved 2015-07-15. ^ Herman, Valli (28 November 2007). "Pasadena Ritz-Carlton to be rebranded". Los Angeles Times. Retrieved 2015-07-15. ^ Doerfler, Sue (15 May 2015). "Ritz-Carlton Phoenix to close, be rebranded". The Arizona Republic. Retrieved 2015-07-15. ^ Grenoble, Ryan (24 July 2013). "Former Ritz-Carlton Double Bay In Sydney Changes Hands For $60 Million Following Celebrity Death". The Huffington Post. Retrieved 2015-07-15. ^ Fitzgerald, Francis Scott (1998). The Diamond As Big As the Ritz. Courier Corporation. ISBN 9780486299914. Wikimedia Commons has media related to Ritz-Carlton.